I think they do an excellent job. I would recommend them without reservation. They get the job done, and they are thorough. They are a company of their word. They're very efficient. It's always a positive experience when we work with Mazen. I've been using Bayside Mechanical for a few years now, and I think they're the best. The quality of everything they've done for me has always been the best of the best. They 100% know what they're doing, and they get the job done quickly. 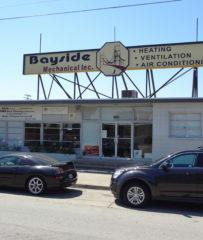 Bayside Mechanical, Inc. provides sheet metal work and heating, ventilating, and air conditioning (HVAC) installation services for residential and commercial clients throughout the Bay Area. The company can design, install, service, repair and upgrade all types of HVAC systems, and it also offers duct cleaning, testing and replacement services. It’s available 24/7 for emergency services and repairs, and its technicians use radio dispatch systems to ensure their response times are as fast as possible. Bayside Mechanical offers several Green solutions designed to optimize its clients’ energy-efficiency—it can replace current HVAC equipment with smaller units and help homeowners who make system upgrades apply for federal tax credits of up to $1,500. Mr. Tawasha explains that those credits also cover 30 percent of the labor and materials involved in a new installation. To learn more or to see examples of past projects, he invites potential clients to visit www.baysideinc.com. DIAMOND CERTIFIED RESEARCHED CAPABILITIES ON Bayside Mechanical, Inc.
Company Name: Bayside Mechanical, Inc.
DIAMOND CERTIFIED RESEARCHED ARTICLES ON Bayside Mechanical, Inc.
Bayside Mechanical has been designing, installing, servicing, repairing and upgrading HVAC (heating, ventilating and air conditioning) systems and equipment throughout the Bay Area since 2004. The company serves both residential and commercial customers, and its experienced mechanics are trained to service all types of HVAC systems from top manufacturers such as Carrier, Trane and Goodman. For the convenience of its clients, it also offers 24-hour emergency service. A load calculation will ensure your HVAC system is the right size to fulfill your energy needs. In order to determine exactly how big or small your home’s heating or air conditioning system should be, your HVAC contractor needs to calculate the system’s heating and cooling capacity in relation to indoor comfort. The result is called the “load” of the home. A home’s load is partly dependent upon its square footage, but a true load calculation goes beyond that to include the building’s construction; orientation to the sun; R-value (a measurement of thermal resistance) of the insulation; number, size and placement of rooms, windows and doors; thermal efficiency of windows and doors; number and arrangement of floors; and climate. Residential load calculations make use of mathematical formulas that take all these variables into consideration. Determining the load by using non-mathematical methods almost always leads to installing an oversized system, which results in increased initial costs, monthly utility bills and maintenance. It can also shorten the lifespan of the equipment by making it cycle on and off too frequently. Who does the load calculation? Your HVAC contractor should be able to perform a load calculation—the process has been computerized in recent years, so it’s not as time-consuming as it was in the past. If the contractor says it isn’t necessary, you may want to look elsewhere. In some areas, local utility companies will perform load calculations. Why is it important to have a correctly sized HVAC system? Having an improperly sized heating or cooling system can lead to multiple problems. Your cooling load consists of two parts: the temperature of the air (the sensible load) and the moisture or humidity in the air (the latent load). An oversized cooling system cools down the temperature very quickly, but it doesn’t run long enough to remove sufficient moisture from the air. Many people turn down the thermostat to make the air conditioner run longer, which increases utility costs. In some cases, the insufficient moisture removal resulting from oversized cooling equipment can lead to mold growth and other types of moisture-related damage. A correctly sized cooling system runs long enough to “wring” moisture out of the air. This will allow you to be comfortable at a slightly higher thermostat setting and save you money on your utility bills. It’ll also take care of “mugginess” without making you feel too cold. Q: Is a permit required for HVAC work? Can you help me get a permit? A: In most cases, a permit is required for HVAC work. We’ll obtain the permit for you. Q: Can you improve the efficiency of my ductwork and reduce the number of leaks? A: Yes. We’ll inspect all the joints and sealant, repair them and replace the insulation as necessary. Q: Is improving the efficiency of an HVAC system really worth the cost? A: It definitely saves money over the long run and is better for the environment. Of course, there’s a greater upfront cost for a high-efficiency system. We can help price out the system that’s right for you by striking the right balance between upfront cost and long-term savings. Q: How long have your employees been with you? A: On average, each employee has been with us for three to four years. Q: Do you provide any financing? A: Yes. Through our partnership with CitiFinancial Retail Services, we’re able to provide a variety of flexible financing options for Carrier products and systems. That way, you can invest in your home’s comfort or respond to an unexpected heating and cooling need without breaking your monthly budget. Plus, you won’t use up your existing funding sources, like a home equity line of credit, bank account or credit card. SELECTED PHOTOS FROM Bayside Mechanical, Inc.
Vincent Casale is an estimator at Bayside Mechanical, Inc., a Diamond Certified company since 2010. He can be reached at (650) 578-9080 or by email. Originally from Brooklyn, New York, Vincent came to the Bay Area soon after marrying his wife, Heather. “Heather is originally from here,” he explains. “We met while she was attending grad school in New York. She always said if we started a family, she’d like to live closer to her family, so as soon as we found out our first little one was on the way, we picked up and headed west.” Today, as a resident of Redwood City (where he lives with Heather and their three daughters, Isabella, Sophie and Emily), Vincent says his two favorite things about his adopted locale are the weather and traffic, both of which he considers moderate in comparison to those of his city of origin. A: Being from Brooklyn, my two favorite teams are the New York Jets and the New York Mets. A: It depends on my mood. Usually, I listen to sports talk radio in the morning, but as my day gets going, I put on music. A: Playing baseball. I also had a lot of friends from different social groups, so I guess I was also known for getting along with everyone. SAN MATEO — A common problem homeowners experience with their HVAC systems is inadequate or uneven airflow. While an HVAC company can resolve your airflow issues, before calling a professional, it’s worthwhile to perform a quick visual inspection of your ductwork to see if you can determine what’s causing the issue. First, check connection points where the ductwork makes a 90-degree turn. When these transitions are made of flexible material, they can become crimped, which constricts airflow. To prevent this, consider replacing all soft, flexible junctions with rigid ones, which can be integrated with the rest of your flexible ductwork. This will rule out the chance for kinking or crimping, giving you 100 percent airflow through those turns. You should also look for leaks in your ductwork. Check all connection points and make sure there aren’t any visible gaps; you can also use your hand to feel for any air flowing out of these junctions. If you detect any air leaks, it’s important to have these resealed as soon as possible. Other things to check for are dips or “bellies” in your ducts, as well as any area of the ductwork that has been crushed or crimped. Sometimes, a technician from another trade will accidentally step on a part of the ductwork and cause a kink. If you have hard ductwork, this won’t pop back into shape, which will result in a permanent airflow issue. Check your ductwork for any crushed or otherwise damaged areas, and make sure the line is tight and straight, with straps in place every five feet. SAN MATEO — Host, Sarah Rutan: If you’re experiencing airflow issues in your home, take a few minutes to inspect your ductwork before calling a professional. Today we’re in San Mateo with Diamond Certified Expert Contributor Vincent Casale of Bayside Mechanical to learn more. Diamond Certified Expert Contributor, Vincent Casale: So, we get a lot of questions at Bayside Mechanical here about airflow issues and problems within the house in some rooms. If you feel that you have inadequate airflow into certain rooms of the house, you can do a quick visual inspection on your own before you call out the professionals. So, one of the first things you can check for in the ductwork is, if it’s in your crawlspace or in the attic, you can go right to where there’s some 90-degree turns. If you’re running flex duct, and you’re running the 90-degree turn, if you don’t run it properly, and you run it too tight, you can constrict the airflow. To avoid that, a good mechanical contractor’s going to use a hard 90. They’ll run the flex duct to one end, and then they’ll continue on here. That’s going eliminate any kinking and give you 100% airflow through your 90 degree. Those calculations you did prior are still going to hold up if you use your hard 90s. Another thing you can check for are bellies in the duct work. Again, if it’s under the house or in the attic – most times, it’s under the house – you’ll see the bellies, where there’s actually some dips in there. Ductwork should be pulled tight, should be all in a straight line, and there should be straps every five feet. So you can check that, and that’s a pretty easy one to spot on your own. Another issue that sometimes pops up are leaks in the ductwork. You can have leaks where we’re branching off into other ducts. So check those connection points. Make sure you don’t see any visual gaps. And you can feel for any air flowing through there. If you feel any air coming out, you definitely have an issue there, and you need to get it resealed. This is one point you can check. Another point you can check would be at the register with the boot. So this is a floor register, this boot is basically under the floor, and your register’s sitting here. Check your connection point at the bottom; same ideas in the Y. One last thing you can check for is crushed ductwork. A lot of times, if people have other trades in the house, somebody can accidentally step on a piece of ductwork. And if it’s hard duct, it doesn’t pop back to form. So, if it’s hard duct and it’s stepped on, you see a footprint on it, somebody banged into it; there’s a good chance that that then needs to be replaced, as well. So, if you come across any of these issues, you can give a professional a call. and they’ll come out and take care of it for you. Diamond Certified RATINGS ON Bayside Mechanical, Inc.
Bayside Mechanical, Inc. : Average 8.8 out of 10 based on 203 unique customer surveys of customer satisfaction. They were very quick and effective. Good service, and they have a good quality of service. The service, I believe, because once I call them, they are there for us. I'm glad I found these guys. They are prompt, efficient, and they do excellent work. They are honest. Overall, they are a top-notch company. I've already tried to convince others to use them. I would give them a "20". They come out when they say they are going to come, and they do a perfect job. That they are a reliable vendor, and they are experts. They are very responsive, and they are reliable. They are quick to respond to emergencies. They are a professional organization. We just used them on a big, complicated job, and they were able to handle everything. They are very friendly and very helpful. They do the job they are supposed to do. They are responsible, and we are able to communicate well with the owner. It is a decent company, but they could be more responsive sometimes. The engineering is pretty good. I would probably not talk about them. When something doesn't work out for me, I don't talk about it. Quite honestly, there is not very much.